John Travolta: HA-HA! You're doing the chicken dance! Greaser #3: Ooooh! Dude, that's just cold. Olivia Newton John: I only have one thing to say: "Shut up, TERL!!" Greaser #2: Oh, SNAP! ... Girl, you're somethin' else! Them shoes are smokin'! What say you and I blow outta here and ditch these losers. 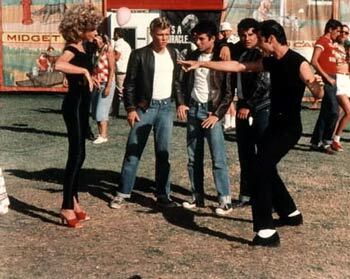 Greaser #1: Dag, Terl, you gonna just stand there and take that? !